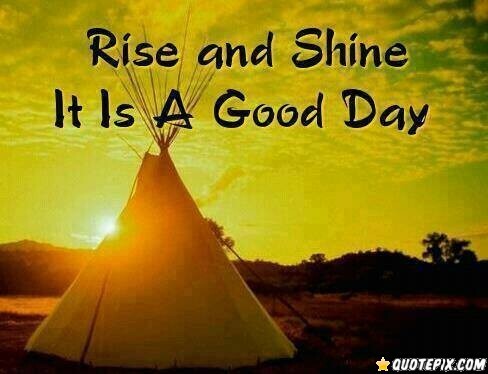 Each morning brings a magical day that can potentially change your life forever. How do you start your morning? Do you rush for a cup of coffee to recharge your body? Do you do some fitness within minutes of waking up? Or do you like to spend a few minutes in bed, rebooting your system? There are many ways to begin a day. Each morning is different. On some mornings you wake up sleepy and grumpy. On others, you wake up feeling WOW! Then there are those mornings when you wake up with a start, realising that you are late for work. Ooops! Can't get going this morning? Put some spring in your step with these WOW tips! Even though your eyes are closed and you’re sitting/lying still, meditation activates the brain. It’s a powerful way to get blood flowing in the brain, adding that 10-15 minutes is all you need. If possible, sit in front of a window where sunlight is streaming in. By the time you get up, you’ve gone several hours without water and are mildly dehydrated - and that can make you feel tired. Drinking something will get your circulation going, which will energise you. Good old H2O will do! When and what you eat for dinner will affect your sleep. A late-night meal will force your body to be busy digesting, which makes it tougher to drift off. If you experience bloating or indigestion, you’re also likely to toss and turn. Even worse, eating large meals late in the evening increases your odds of waking in the middle of the night to go to the bathroom. If you must eat late, cut back on portions and keep the meal light. In a nutshell, rise and shine and keep shining… I think that nothing is impossible when you want to fulfill a dream. A lot of people will tell you that you can't do it, that you don't have what it takes, but if it is in your heart and you feel it, there is nothing that will stop you. It is like the sun - you can't block it: it will shine regardless, if that is what you want. The sun does not shine for a few trees and flowers, but for the joy of the whole world. We are told to let our light shine, and if it does, we won't need to tell anybody it does. WOW Fact -Lighthouses don't fire cannons to call attention to their shining - they just shine. Rise to a new week and catch the rays! I love this German word, which has no English equivalent; it means “the longing for something”. In my mind it has romantic and magical connotations. C.S. Lewis who was one of my favourite childhood authors defined it as the ‘inconsolable longing’ in the human heart for ‘we know not what’. WOW Fact - Because the concept of Sehnsucht is so important in Lewis' writing, the Arizona C. S. Lewis Society titled their annual journal Sehnsucht: The C. S. Lewis Journal. Imagine taking away unobtainable goals and replacing them with smaller goals to create direction in your life. This will help you on your yellow brick road toward your ideal self. What I am saying here is that you have to use your “imagination”. 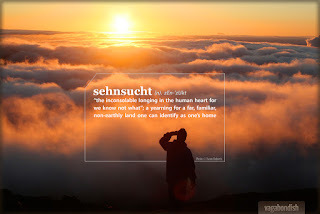 In a nutshell, Sehnsucht has important development functions, including giving pointedness for life planning and helping to cope with loss and important, yet unreachable wishes by chasing them in one's imagination. BUT, WOW Fact - the majority of people who experience it are not conscious of what or who the longed for object may be, and the longing is of such wisdom and intensity that the subject may immediately be only aware of the emotion itself and not conscious that there is a something longed for. My eyes are open – but I’m not looking outward. I turn inside – I turn to my inner light. Will my inner light shine, what will I find inside? I’m like a blind man searching for sight. Because he’s not searching for another. Some ask – how does time pass? I ask – how did time begin? That comes and goes, comes and goes. I so miss the longing. The 3 Wise Monkey's...or is it 4? Remember the three wise monkeys? One covered its eyes as if to say, 'See no evil'. One covered its ears as if to say, 'Hear no evil'. The third covered its mouth to communicate the idea that we should all strive to 'speak no evil.' But should there not also have been a fourth to signify the need to 'think no evil?' Perhaps that's just too far fetched! YOU can discipline yourself to behave well... but YOU can't prevent your mind from having the opinions it holds. Some people keep their opinions about anything in their personal life, like a prisoner…at WOW Health, Fitness & Wellness classes we are open minded and respectful to people’s opinions which are ultimately determined by feelings. We realise that having a low opinion of yourself is not modesty, it’s self-destruction. We discuss that it doesn’t matter what other people think because if you make the right choice to create positive changes FOR YOURSELF, that is all that matters. YOU don’t need anyone’s approval, validation or support…and a lot of the time, YOU really should avoid it.